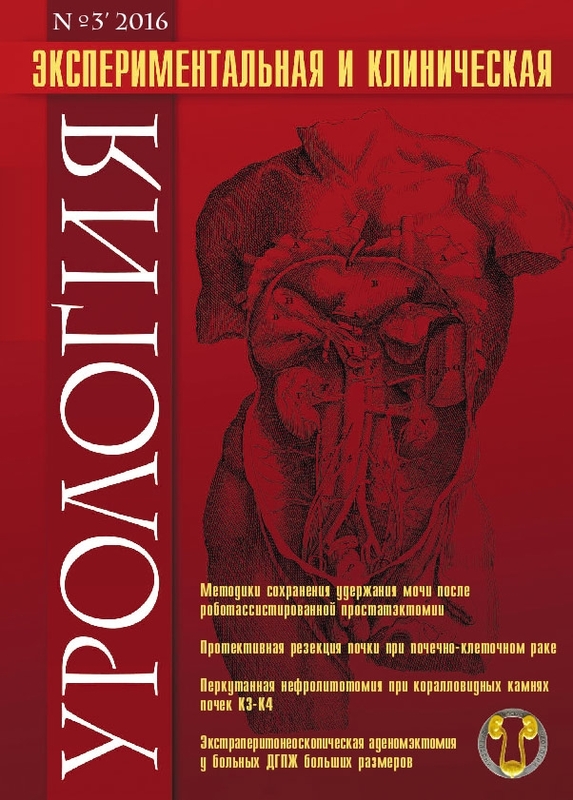 The analysis of uronephrologic morbidity and mortality in Russian Federation during the period of 2002-2014 according to the official statistics Kaprin A.D., Apolihin O.I., Sivkov A.V., Solnceva T.V., Komarova V.A. «School for Health and Active Social Longevity» as a tool of engaging patients in the care of their health Apolihin O.I., Sivkov A.V., Shaderkin I.A., Kazachenko A.V., Skvorcova D.A., Prosyannikov M.Yu., Voytko D.A., Coy A.A, Zelenskiy M.M. Bioinert and adhesion properties of materials Shkodkin S.V., Kogan M.I., Kolpakov A.Ya., Bondarev V.P. The results of Iridium192 high-dose rate brachytherapy application combined with distant radiotherapy in patients with seminal vesicle invasion prostate cancer Solodkiy V.A., Pavlov A.Yu., Cybul'skiy A.D., Garmash S.V., Ivashin A.K., Isaev T.K. Protective partial nephrectomy in patients with renal cell carcinoma Seregin A.V., Shustickiy N.A., Indarokov T.R., Seregin A.A., Morozov A.D., Mulabaev A.K. Growth rate and cell loss in prostate cancer Zharinov G.M., Chepurnaya I.V., Pozharisskiy K.M., Kudaybergenova A.G., Neklasova N.Yu., Bogomolov O.A. Methods of urinary continence maintenance after robot-assisted prostatectomy: a literature review Zingerenko M.B., Lahno D.A. Percutaneous nephrolithotripsy in treatment of complex kidney stones: structural biomodeling Gadzhiev G.D., Grigor'ev V.E., Mazurenko D.A., Malhasyan V.A., Obidnyak V.M., Pisarev A.V., Tagirov N.S., Popov S.V., Petrov S.B. The ACS system: a new way of prognosis for the effectiveness of percutaneous nephrolithotomy Gadzhiev N.K., Grigor'ev V.E., Mazurenko D.A., Malhasyan V.A., Obidnyak V.M., Pisarev A.V., Tagirov N.S., Popov S.V., Petrov S.B. Percutaneous nephrolithotomy in treatment of staghorn kidney stones Merinov D.S, Artemov A.V., Epishov V.A., Arustamov L.D., Gurbanov Sh.Sh., Fatihov R.R. Urethral stenting in urolithiasis: problems and solutions Strel'cova O.S., Krupin V.N., Pochtin D.P., Yunusova K.E., Scherbatyuk T.G., Yashanova M.I., Mamonov M.V. An open randomized study of the effectiveness of treatment of males with chronic prostatitis (categories II and IIIA) applying levofloxacin and tamsulosin combined with IndigalPlus Kogan M.I., Kul'chavenya E.V., Kaprin A.D., Novikov A.I., Krupin V.N., Ibishev H.S., Rodygin L.M., Kiselev V.I., Druh V.M. Antiinsomniac therapy in patients with refractory nocturia and benign prostatic hyperplasia Shestaev A.Yu., Protoschak V.V., Gordeev V.V., Matich A.I., Gul'ko A.M. The effectiveness of application of extracorporeal shock wave therapy combined with phytotherapy for treating patients with prostatоlithiasis Kul'chavenya E.V., Brizhatyuk E.V., Shevchenko S.Yu., Baranchukova A.A.
Technical aspects of extraperitoneoscopic adenomectomy in patients with large volume benign prostatic hyperplasia Kachmazov A.A., Keshishev N.G., Gurbanov Sh.Sh., Kovchenko G.A., Osipov O.V., Grigor'eva M.V., Kazachenko A.V., Sivkov A.V., Alekseev B.Ya. Pathogenic mechanisms of pain in chronic bacterial prostatitis Shormanov I.S., Solov'ev A.S.
Modern methods of instrumental diagnostics of vasculogenic erectile dysfunction Kaprin A.D., Kostin A.A., Kruglov D.P., Popov S.V., Kul'chenko N.G., Mangutov F.Sh. The effectiveness of extracorporal shock wave lithotripsy of urinary stones with different chemical composition Grabskiy A.M.
Metaphylaxis of uric acid kidney stones Konstantinova O.V., Yanenko E.K., Shaderkina V.A. Endocrinological aspects of chronic cystitis in women Tyuzikov I.A., Kalinchenko S.Yu. Genetic risk factors for recurrent urolithiasis Apolihin O.I., Sivkov A.V., Konstantinova O.V., Slominskiy P.A., Tupicyna T.V., Kalinichenko D.N. Effects of genetic polymorphisms on the terato- zoospermia and karyopathological abnormalities in the desquamated epithelial urogenital tract cells in male shift workers with infertility in oil and gas fields of the north of Siberia Il'inskih N.N., Il'inskih E.N., Tagaev A.V. The causes of lower urinary tract dysfunction in patients with invasive cervical cancer after radical hysterectomy Muhtarulina S.V., Kaprin A.D. The osmoregulatory function of kidneys in women with different types of urinary incontinence Osipova N.A., Guliev B.G., Niauri D.A., Gzgzyan A.M.